With plugins like Advanced Custom Fields taking the WordPress world by storm, we are using Custom Fields to power our WordPress-powered websites more than ever before. SearchWP was built to take into consideration the extensive utilization of Custom Fields (sometimes referred to as postmeta or metadata) for searches as well! What does SearchWP integrate with? 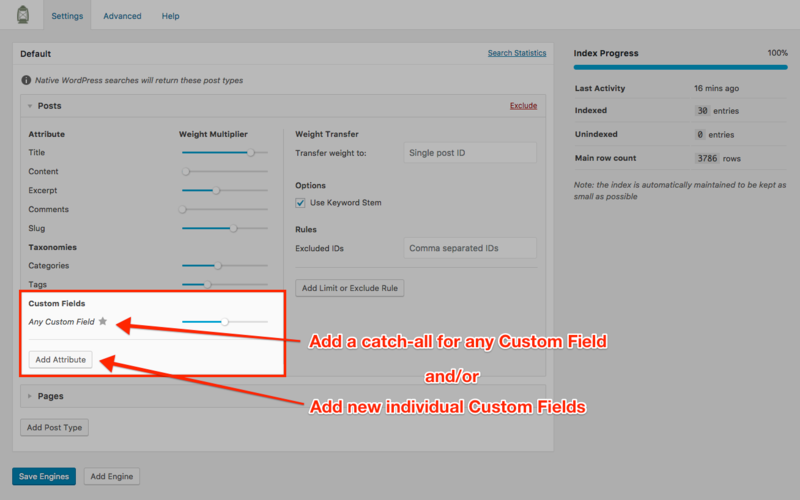 It doesn’t matter to SearchWP what plugin you may be using to power your utilization of Custom Fields, it works directly with the Custom Fields API in the same way your favorite custom fields plugin does. and many more (probably the one you’re using)! If you’re curious if SearchWP will work with your Custom Field plugin, please ask! Integrating your Custom Field content with search results using SearchWP is quick and easy — just add your Custom Fields to your engine configuration and give them a weight. That’s it! NOTE: you can add an ‘Any’ Custom Field to SearchWP’s engine configuration that accounts for data stored in any Custom Field.